As last month’s topic was about using shoelaces as an alternative to hair ribbons, the question has come up about knowing which hair ribbons match which shoelaces as shown in the the example I gave with the golf shoes below. The one thing I’ve done across all of my shoelace shops as well as my hair ribbon shop is to provide consistent names to matching colors of ribbon/shoelaces for each fabric type. In the example above, the 1/4″ grosgrain shoelaces and the 7/8″ hair ribbon are both labeled as “Red”. I’ve done this for Satin, Organza and Grosgrain shoelaces and hair ribbons for all widths. The examples below show just how easy it is to match shoelaces to hair ribbons. 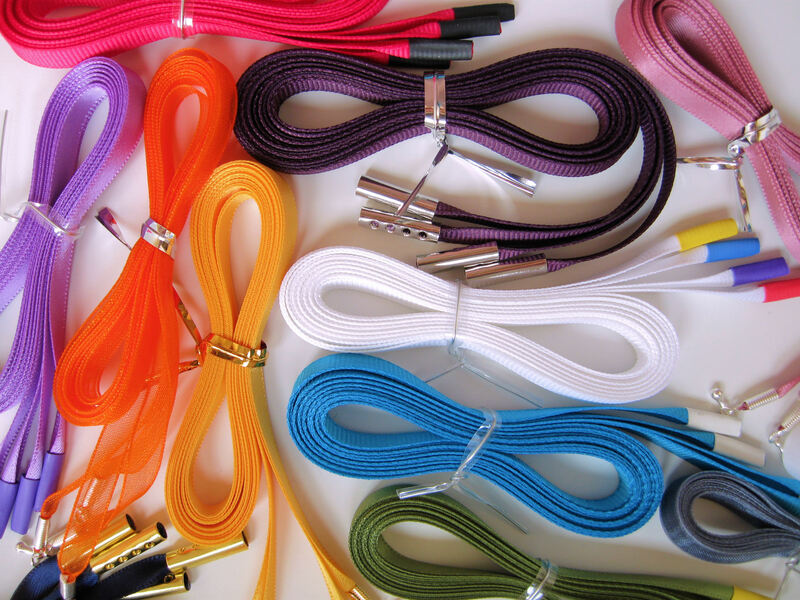 If you’d like to match 5/8″ shoelaces to 1/5″ hair ribbons, note the colors on the listing. You’ll notice that each color is available for both the shoelaces and the hair ribbons, and no matter how they may appear on your screen, colors with the same names match, so while Spruce may appear darker on the shoelaces listing, it indeed matches the Spruce on the hair ribbon listing. For purchasing these items, the hair ribbons are available at one shop, and the shoelaces are available at three shops. The same applies to the 5/8″ organza shoelaces and the 7/8″ organza hair ribbons. Note that there are colors in the hair ribbons (yellow, rust and lime), that don’t have a corresponding shoelace color, so always do a cross reference before purchasing to ensure there is a corresponding match in your color. And of course the same holds true for the example of 5/8″ grosgrain shoelaces and 7/8″ grosgrain hair ribbons. Note that similar colors that are not identical have been intentionally given different names, so you’ll know they are not an exact match (e.g. Tangerine vs. Orange, Golden vs. Gold, Daffodil vs. Yellow, etc.). This entry was posted in FAQ Topics and tagged All About Shoelaces, Custom Shoelaces, Grosgrain Hair Ribbons, Grosgrain Shoelaces, Hair Ribbons, Lost in Lace, Matching Hair Ribbons, Organza Hair Ribbons, Organza Shoelaces, Ribbon Shoelaces, Satin Hair Ribbons, Satin Shoelaces, Shoelaces.